This dry nitrous system is full adjustable from 50-100HP and up to 175HP with special tuning. The best part is that it works with your factory EFI system. 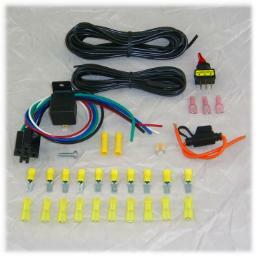 This Dry system utilizes your factory injectors to add the extra fuel needed to make more power. By spraying Cold Nitrous oxide across the MAF (Mass Air Flow Sensor) it tricks the factory computer into thinking there is a lot more air going into the engine. The Vehicles factory ECM adds additional fuel via the OEM fuel injectors. Simple, clean and very powerful! This System will work on 8 Cylinder Engines and comes complete with all the parts and instructions needed for installation. The system is adjustable from 50 to 100 HP. >2 foot Braided stainless Nitrous line with Blue fitting. >Dry Nozzle Mounting adaptor so the Nozzle does not blow out during injection, makes mounting the nozzle in plastic or rubber a snap! This Dry EFI Kit is the most complete kit available. Quality stainless steel components are standard on all DynoTune Nitrous kits. This DynoTune Nitrous kit is tuned for Safe reliable Horsepower increase on vehicles with hot wire MAF sensors(most GM and Ford vehicles plus some imports). More and more folks are switching to DynoTune products due to the price, Performance, innovation and support you will get with no other Manufacturer. Isn�t it time you made the switch?